Pool Accidents: Pool Chemicals Accidents - What Went Wrong? A pool accident in Sumter, SC sent the Headmaster of Wilson Hall, a college preparatory school, to the hospital. No, this is not another case of drowning. A report from WistTv.com says that Head Master Fred Moulton was preparing his swimming pool for use when the accident happened. According to Assistant Head Master Ed Talley, Moulton was mixing pool chemicals outside his pool Friday afternoon when the chemicals suddenly exploded burning his face and clothes sending him to Augusta Burn Center. Moulton is now recovering from burns he received on the right side of his body and expected to be released from the hospital on Tuesday. The details about the pool chemicals he mixed were not mentioned. This news reminds me of another pool chemical accident I've read from AzCentral.com way back in May 2008. The incident happened Monday also in the afternoon. The Mesa Fire Deputy Chief Mike Dunn detailed that the unnamed man was mixing a concoction of four pounds of powered algaecide with several one pound bags of granular chlorine all in a five-found bucket. This might caused the chemicals to react explode and burn the man's head, arms, torso and legs. The man managed to call 911 and when the Chandler firefighters arrived they quickly grabbed the garden hose and sprayed water to the man to remove the toxic materials off him and was taken to Maricopa Medical Center. The question here now is; what went wrong? An investigation conducted by Chemaxx shows that pool chemicals are either made of calcium hypochlorite or Ca(OCI)2 and Trichloro-s-trizinetrione or Trichlor. These 2 compounds are both sold in a form of pool chlorine, the problem is... they are incompatible that pool owners consider them to be the same pool chemical product. Incompatible compounds should never be mixed because it can cause some chemical reactions that may result to explosion. It is quite intriguing to know that some pool chemical companies sell these two incompatible chemicals under the same brand. So how do you deal with pool chemical mixing? Always check the labels if the two chemicals are present upon buying pool chemicals. You can also contact the manufacturer or a pool maintenance professional. Never ever mix pool chemicals that are of different compounds such as algaecides and chlorine. Also, most pool owners make a mistake of adding water to pool chemicals, it should be the other way around; add chemicals to water instead. To maximize safety, wearing goggles, gloves and other safety equipment when mixing pool chemicals is strongly recommended. In case of an accident quickly spray yourself with water just like what the Chandler firefighters did. It also recommended not to mix chemicals in the house. 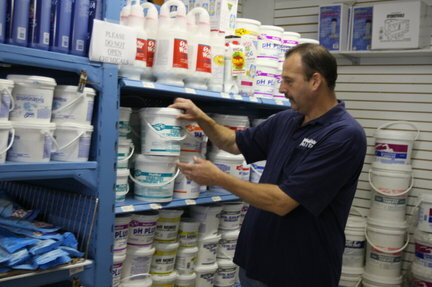 And don't compromise storage, pool chemicals should be kept in sealed containers and should be placed in a well-ventilated exterior shed away from children's reach. Pool chemicals manufacturers should also do their part such as lowering the amount of calcium hypochlorite in their products, not selling products of different chemicals side-by side and make it visible enough for the customers to see the chemical contents of their products. So its always advisable to follow some sort of pool safety rules that could give a happy swimming.